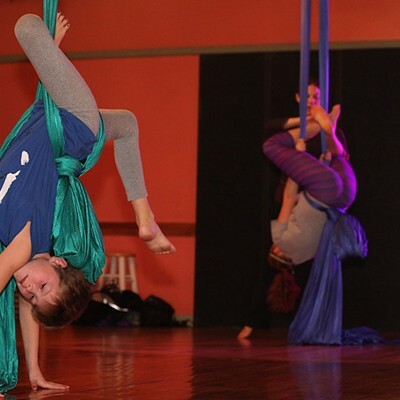 Aerial Dance | Fit Families | Kids VT - small people, big ideas! When my sons were toddlers, they loved to tumble on mats, flip over parallel bars and balance on beams at our local gymnastics studio. But by the time they went to elementary school, they didn't know any other boys their age who did gymnastics. Eventually, they decided to drop out. It made me sad because, as a fitness professional, I know that gymnastics, dancing and acrobatics are great exercise for any gender. 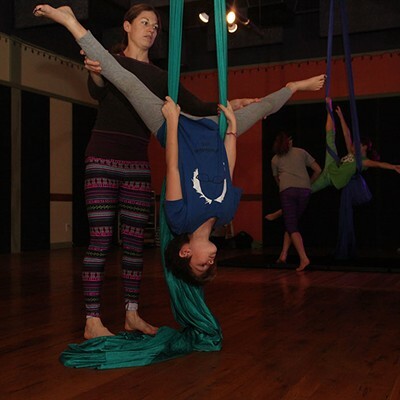 So I was excited for the opportunity to introduce my 8-year-old son, Zac, to aerial dance. It's essentially acrobatics done with fabrics — often called silks, although they're typically made of nylon — mounted on the ceiling. 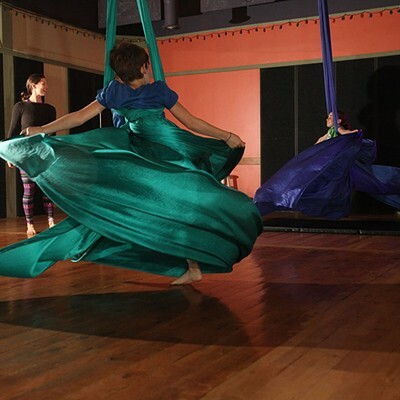 Dancers climb, hang, spin and soar with the fabric wrapped around their legs, arms and torsos. Zac and I had recently gone to the Flynn Center for Performing Arts to see Flip FabriQue, a Québec-based dance troupe that does aerial acrobatics with hoops, ropes, fabrics and trampolines. He enjoyed watching the dancers' playful antics and gravity-defying feats, and was excited to try something similar. 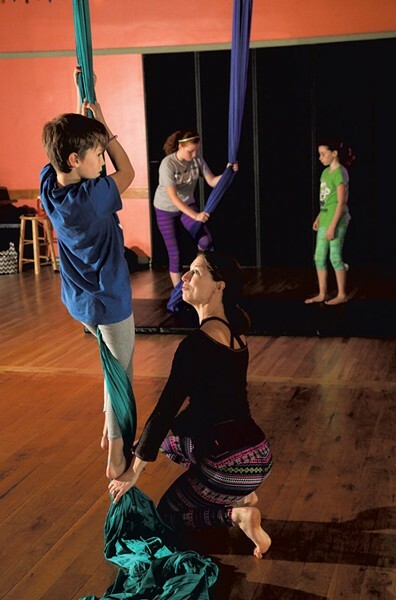 We went to a class taught by dancer Nicole Dagesse, who opened an aerial studio at North End Studios in Burlington last August. The studio was spacious, with smooth wood floors and mirrored walls. Green and purple fabrics dangled from clamps attached to beams on the ceiling, and soft music played from a corner stereo. The day we attended, five girls and two boys, ages 7-10, participated in the class. 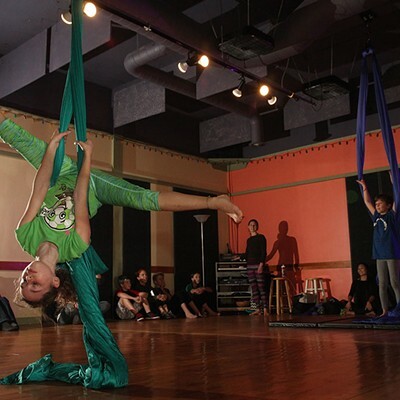 Clad in athletic pants or tights, T-shirts, and bare feet or socks, the kids worked in small groups at each fabric, taking turns swinging and spinning with a spotter. Dagesse helped Zac lie forward with a green silk looped beneath him. She told him to push the fabric under his thighs rather than his belly. Seven-year-old Elijah spotted Zac as he spun in circles with his arms and legs extended, as if flying. Zac said he could feel his tummy and leg muscles working. Throughout the class, Dagesse offered support. "Nice transitions," she said. "Try to keep your hips low so you're using your core and shoulders." Next Dagesse instructed the children to imagine they were tigers crawling through the jungle as they moved through a series of challenges: Swing back and forth on the purple fabric; slide and roll on the floor to the green fabric and pull up on it to stand; raise both legs in a sweeping motion; return to the floor; crawl along the mats back to the end of the line. In another activity, the children improvised stories about explorers and creatures emerging from cocoons, using the fabrics wrapped around them as imaginary shelters. "Teaching improvisational and choreographic skills allows the children to expand their dynamic range and encourage new movement," Dagesse told me later. "I use animal imagery, things that are gender-neutral. It makes it different than other styles of dance that are more targeted to females." 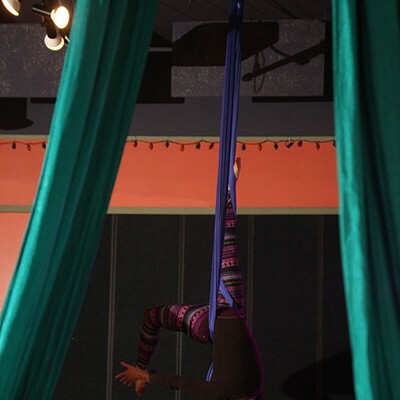 She then showed the group how to climb up a fabric, rotating a lower leg to wrap the cloth around her foot. This gave her leverage to climb higher, and she continued wrapping and climbing until she reached the top. Zac was eager to try out the move. "It's hard work," he said as he descended. I could see it was a total body workout. I could also tell by his smile that he enjoyed spiraling on the silks, imitating the whimsical moves of the male dancers in Flip FabriQue. To keep active kids engaged, Dagesse has them practice high-energy moves, like climbing high and spinning fast. "It's a good way to build interest," she said, "and get them hooked." 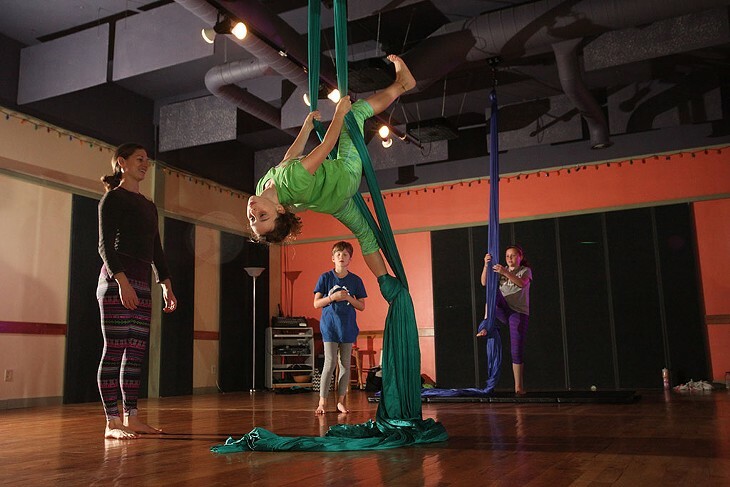 Kids' aerial dance classes take place on Monday afternoons at North End Studios (294 N. Winooski Ave., Burlington). 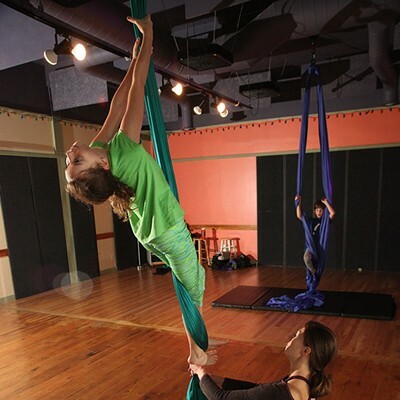 Attend an Intro to Aerial workshop on Saturday, November 12, or an Aerial Playshop for Families on Friday, November 25. For more information, visit northendstudios.org or email Nicole Dagesse at ndagesse@gmail.com.